I’ve worked several 9-to-5 jobs in my time, among them: janitor (dress factory); assembly line worker (textile factory, shoe factory); and book cataloguer (university library). Indiana University - Bloomington will host the 2017 annual Working Class Studies Association Conference, May 31 - June 3. --This blog by Patrick Brantlinger originally appeared in the "Herald-Times" (Jan. 30, 2017) as a guest column. Byron Bangert, Bloomington Human Rights Commission chair: Have you seen this decal at the restaurants you patronize? "Shop Local" Isn't Necessarily the Same as "Shop Right"
With the holidays near, can calls to “shop local” be far behind? 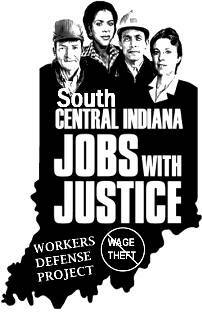 Below is a summary of the accomplishments of South Central Indiana Jobs with Justice during the past year. Please join us in 2015 to help advocate for workers and their families!